It was my husband’s birthday last week and as usual it was way too hot to bake. I can’t remember what birthday dessert I made for his birthday last year but I do recall having Dairy Queen Blizzards the year prior. This year it was my husband’s 40th so I wanted to make something extra special that wouldn’t give us a sugar hang-over so I decided to make a chocolate ice-cream cake. After spending way too much time on Pinterest for recipe ideas I decided to create the simplest dairy-free, gluten-free ice-cream cake possible. Overall, I’d say my first attempt was successful. It wasn’t the easiest cake to slice but it sure tasted delicious. 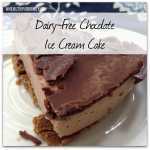 This recipe can be used as a template for any 3-layer ice-cream cake you want to create. The first layer is a cookie crust. You can use any dry and crunchy cookie you like. I used crispy gluten-free gingersnaps. The second layer is the ice-cream. If you are short on time, you could buy the ice-cream but we have an ice-cream maker that makes beautiful coconut-milk ice-cream in about 20 minutes. The final layer is chocolate. I made a chocolate sauce from scratch but you could easily melt chocolate chips with a little bit of coconut oil. I also suggest you block off enough time for chilling each layer as you make it. This ice-cream cake is easy to make but it’s not quick. I think the effort is worth if you want an ice-cream cake that doesn’t contain dairy, gluten and high fructose corn syrup. Place the cookies and coconut oil in your food processor until it looks like coarse sand. Take the crumbly mixture and spread it on the bottom of a spring-form pan or pie plate lined with parchment paper. Press down firmly to create the cookie crust. Chill the crust in the freezer for about 1 hour or until frozen solid. While the crust is chilling, it’s time to make the ice-cream. Add all of the ice-cream ingredients including the dissolved gelatin into a blender and blend until smooth. Pour the mixture into a bowl or pan and chill in your freezer for about 30 minutes. You want it chilled, not frozen. Remove the mixture from the freezer and stir before pouring into your ice-cream maker. (Follow the directions for your ice-cream maker). It took about 15 minutes. Quickly scoop out all the ice-cream on to your chilled crust and smooth it out. Place it in your freezer until frozen solid. Mine took about an hour. Take out a small saucepan and melt the coconut oil and cacao butter wafers on low heat. If you are using a spring-form pan you can take the cake out after letting it sit on the counter for 5-10 minutes. 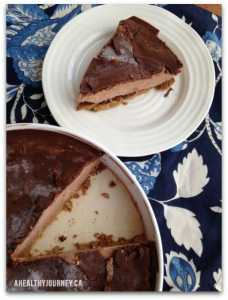 Place cake on a flat plate or serving dish. If you are using a pie plate just leave the ice-cream cake in it. Pour the slightly cooled chocolate sauce on the ice-cream layer and quickly spread before it hardens. Place the finished ice-cream cake back in the freezer and chill until the chocolate layer has hardened. * *When you are ready to serve the ice-cream cake, remove it from the freezer and let it sit on the counter for 15- 20 minute to soften. This will make it easier to slice. The chocolate topping may crack a little and the crust will require some effort to slice through. Don’t worry if your slices aren’t picture perfect. No one will care once they have their first bite. Warning: Your guests may ask for a second slice.